The menace of obesity is on an all time high and has affected children, adolescents and adults throughout the world so much so that it may be called an epidemic. The reason behind obesity is multi-factorial and may encompass genetic, hormonal, and neurological as also physical and dietary activities of the individuals concerned. Recently scientists from different parts of the globe have suggested that the gut microbiota from various taxonomic backgrounds might as well have a big role to play in the cause of this diseased condition. In addition, the different genes associated with this microflora can modulate and be linked with obesity. Obesity can lead to different other human disorders and therefore needs to be curbed. One of the ways of regulating the disordered state of the health is to burn up the intake calories through proper workout. However, with our present day lifestyle and busy schedule it becomes really a tough task to bring this habit within our work system with a regular effect. Will it not be just wonderful if that role is being played by some of our friends, the probiotics? Recent developments indicate that it can be quite a possibility. The scientific community is more inclined towards delineating the function of the gut microbes in the cause of obesity. Backhed and group have carried out intensive animal experiments to establish the underlying mechanism behind the disorder as contributed by these microorganisms and found that this probably has to do with the increased level of nutrient absorption, digestion and fat deposit in the adipose tissues. The gut microbiota also results in the enhanced breakdown of dietary ingredients like non-digestible carbohydrates (constitutes nearly 10% of an individual’s diet) with an overall improvement in the energy extraction capacity of the host. Although some beneficial effects can be attributed to this enhanced activity, fat deposit and obesity can be the side effects that negatively influence the host health. Delzenne et al. has carried out experiments that analyzed the differences between germ free and normal individuals in their response to nutrients and the variation on the composition of the gut microorganisms. It was demonstrated through the study that the microbes induce a wide variety of host responses within the GI tract and control the immunological barrier and the hormonal functions. The purview of the activity of the gut microbes is not restricted only within the intestine but they can also affect metabolism outside of it like the liver thereby modifying glucose and lipid metabolism there. Such microbial population within the human beings can modulate the gene expressions that are intricately associated with catabolic pathways. They even result in the synthesis of neurocrine agents within the body. The microbiome within the gut therefore presents the scientific community a potential target to explore for the regulation of obesity and diseased condition of similar nature. Mere understanding of the role of the gut microbes is not sufficient to combat the problem as recent studies has signified the importance of the relative presence of specific communities like Bacteroidetes or Firmicutes to act as determining factor in the balance between lean and obese conditions since they play important roles in the maintenance of energy homeostasis. Obesity has been significantly linked with a decrease in the number of Gram (-) bacteria like Bacteroidetes and a concomitant increase in Gram (+) Firmicute bacteria. The probiotic strains can be used to manipulate the gut microbial population. The usage of probiotics to this effect is regulated by the FDA (USA) and the European Commission. The strains of both Lactobacillus and Bifidobacterium which belong to the Firmicute category are routinely used for this purpose. There have also been instances of childhood obesity by the use of certain Firmicutes. Therefore, more work needs to be done in this regard in order to put them into direct use in the control of weight gain in the obese individuals. Can the bifidobacteria bring about the required changes? The work of cani and his group have proposed the use of the prebiotic oligofructose which induces the selective growth of the probiotic strains of Bifidobacterium. They have also been able to demonstrate that the use of this prebiotic-probiotic combination results in the permeability of the gut epithelial membranes that is being induced by the high fat presence and thereby reduced lipopolysaccharide absorption from the lumen of the gut. The reduction in the permeability of epithelial layer of the gut resulted in the normal expression of the genes associated with tight-junction like Occludins which regulates the gut epithelia permeability. The decrease in the epithelium permeability also reduces the cytokines that are pro-inflammatory in nature. In yet another study by Ali et al., it was established that isoflavones have useful impact on the metabolism of carbohydrates and lipids. The probiotic strains might enhance the beneficial potential of the isoflavones by converting them into active forms of aglycones so as to produce a synergistic outcome. In a recent study conducted by the NIH (National Institute of Health), USA it was suggested that the probiotic administration can be used to treat obesity and related disorders. The use of the probiotics resulted in the reduced resistance to insulin and gain in body weight through the alteration in the gut microflora. The useful probiotics also result in the enhanced secretion of GLP-1 hormone that will cause decrease in food intake. The probiotics yielded higher short chain fatty acid levels like butyrate which stimulates increased GLP-1 release from the intestinal cells. Therefore, the present status of obesity related studies suggest that the use of probiotics can definitely control the growth of the gut microbiota thereby regulating the problems of obesity. However, the application of specific probiotic strains in the maintenance of Bacteroidetes and Firmicutes balance to curb weight gain needs to be probed further. Recent research provides several instances of the successful identification of prebiotic-probiotic combination under such circumstances. 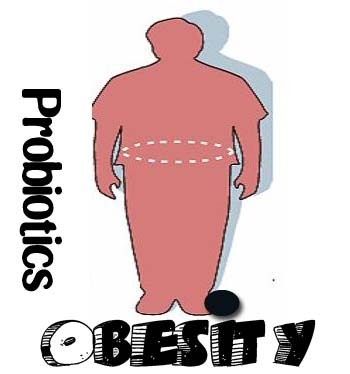 Hence, probiotics can be used in the future with greater potential for obesity inhibition.